A handful of flaws, but this fun and addictive city-builder still climbs high. What is it? City building and management sim. Reviewed on: Intel i7 x980 3.33 GHz, 9 GB RAM, Nvidia GeForce GTX 960. 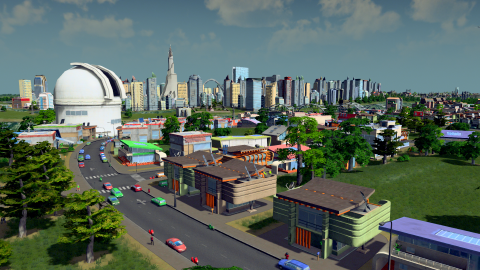 Cities: Skylines didn’t have to stretch far to trump 2013's SimCity: it needed to be a good city builder without any of EA’s mistakes. That means no always-online DRM, an expansive area to build in, and support for custom content. The good news: Skylines does all this. The better news: it's also a fun and addictive city building game. It's not unexpected that Skylines' biggest challenges involve roads and traffic, as it comes from Colossal Order and Paradox Interactive, the same developer/publisher duo as Cities in Motion, a game based around transportation management (Cities: Skylines is not related to the Cities XL series). Laying down roads is easy. It's more difficult to lay down roads that make sense. It's not just traffic congestion you need to worry about, it's logical traffic routes. Garbage collection, unattended building fires, and dead body removal were recurring problems in all my cities, and it's because they all involve vehicles (hearses, in the last instance) needing to get to specific locations quickly, which is as much a function of easy access as of smooth traffic. Figuring out the best way to build roads and intersections takes time, experimentation, and close scrutiny, something I think many players will really enjoy. If you're more interested in building unbroken tree-lined avenues and long, winding roads than logical grids, you certainly can, but be prepared for your city to lose a good deal of functionality. Once you've got some roads built and have assigned them as residential, commercial, and industrial, basic buildings will begin appearing. Add nearby services like police stations and schools, and amenities like parks and plazas to allow buildings to level up. You can also use a brush tool to divide your city into districts. Districts are a great feature, allowing you to tinker with policies and regulations like recycling, free public transportation, and legal drug use, without having to unleash them citywide. You can tax your districts differently, and even ban industrial traffic in congested areas (just make sure to provide heavy trucks an alternate route). You can also create industrial districts to focus on oil and ore mining, logging, farming, or general industry. In addition to managing the physical aspects of your city, you'll have to keep an eye on your bank account and supplement it with loans, decide what to budget for various utilities and services, and tweak taxes for residents and business. None of this feels deep, simulation-wise—it's mostly fiddling with sliders and finding a balance between keeping a positive revenue and annoying residents with steep taxes—but nothing about Skylines' simulation feels terribly deep, at least economically, and apart from focusing on specific types of industries, or choosing office towers over factories, none of my cities have felt particularly specialized. That suits me just fine, though players looking for a deeply complex city simulation might be a little disappointed. Skylines' UI is pretty slick and easy to understand. You can view your city through several filters: pollution (including noise), crime, property values, wind speed (for turbine power), water and electricity availability, and even see how many people are using public transportation. Icons appear above buildings to signal problems, like businesses with a dearth of customers or homes with sewage problems. Citizens can also communicate with you via "Chirper," a Twitter-like feed at the top of the screen. This gets repetitive pretty quickly, but a menu option thankfully prevents these messages from automatically popping up. At times, Skylines is intensely satisfying, such as when solving a troublesome traffic snarl or when all the buildings in a district begin leveling up because you've provided the right combination of services and amenities. It's often soothing, like when flying the free camera around or peering down at the tiny NPCs living in your creation. It can also be terrifically tense, like when you realize your industrial zone has poisoned the groundwater of a residential area or when a power grid gets overloaded and you've got no money to add a new plant. The citizens of Skylines are pretty tolerant, but let them suffer too long and they'll abandon you in droves. There are a few issues. I wish plumbing was just auto-drawn in when roads are built, not because drawing pipes manually is hard but because it's easy, and thus begins to feel like repetitive busywork after a while. Even when business and resident satisfaction is sky-high there's sometimes zero demand for new buildings (and thus no population growth) for long stretches, and then, seemingly arbitrarily, demand suddenly ramps up again. Even in happy, healthy neighborhoods and commercial districts, entire buildings are routinely abandoned, and I don't quite know why. Driver AI is a little off-kilter, and cars will sometimes cram into a single lane when others are available, which can contribute to traffic problems. These issues haven't done much to dampen my enjoyment, though. My cities, even the poorly planned ones that wound up filled with horrific traffic jams and uncollected corpses, were all fun to build, and I learned enough from each to make my next city better. For those who find building a city to Megalopolis status just a little too easy—and I think it is—there's a 'hard mode' included to increase the challenge. Conversely, for those who want completely unrestrained construction, there are modes for an unlimited bank account and the unlocking of all buildings at the start. Due to the map and asset editor, I suspect the Steam Workshop will quickly fill with custom creations. It ran very smoothly on my GeForce GTX 960, even when zipping and zooming the camera around in my biggest city. Top it off with Cities: Skylines' reasonable price, and I suspect no matter what your interest in city building, casual or intense, you'll find a lot here to like. Monuments let you add space-age buildings to your city. Legalizing drugs in PC Gamer Hills. What could go wrong? Building a police station brings a smile to the entire town. You can follow and rename any NPC you want. Even cows. First you didn't like that the taxes were so high. Now you don't like being completely underwater. I can never make you happy. I guess people are dying to live here.